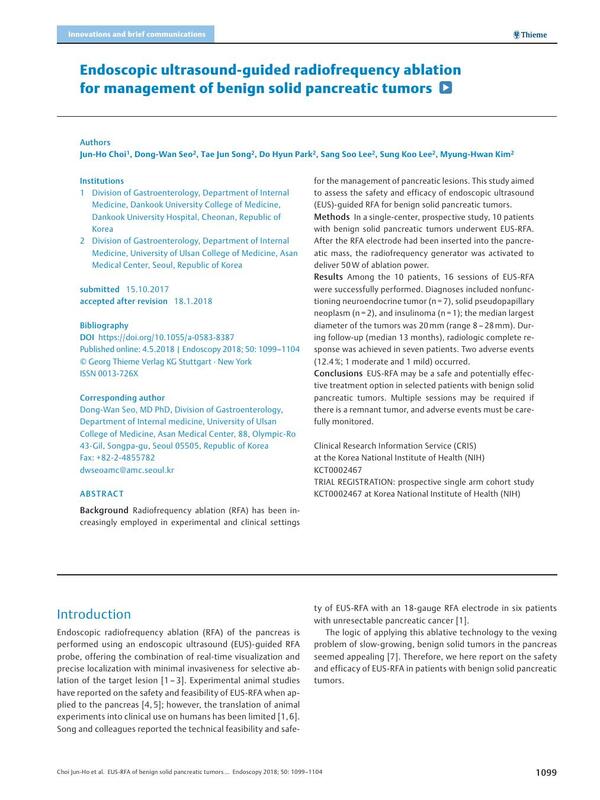 Background Radiofrequency ablation (RFA) has been increasingly employed in experimental and clinical settings for the management of pancreatic lesions. This study aimed to assess the safety and efficacy of endoscopic ultrasound (EUS)-guided RFA for benign solid pancreatic tumors. Methods In a single-center, prospective study, 10 patients with benign solid pancreatic tumors underwent EUS-RFA. After the RFA electrode had been inserted into the pancreatic mass, the radiofrequency generator was activated to deliver 50 W of ablation power. Results Among the 10 patients, 16 sessions of EUS-RFA were successfully performed. Diagnoses included nonfunctioning neuroendocrine tumor (n = 7), solid pseudopapillary neoplasm (n = 2), and insulinoma (n = 1); the median largest diameter of the tumors was 20 mm (range 8 – 28 mm). During follow-up (median 13 months), radiologic complete response was achieved in seven patients. Two adverse events (12.4 %; 1 moderate and 1 mild) occurred. Conclusions EUS-RFA may be a safe and potentially effective treatment option in selected patients with benign solid pancreatic tumors. Multiple sessions may be required if there is a remnant tumor, and adverse events must be carefully monitored.